Children are naturally inquisitive. Each day is a new day to learn and the more they are exposed to, the more they will absorb. 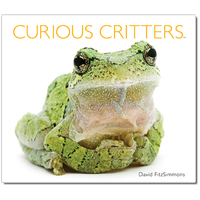 Visit the Curious Critters website for more information, fun and games, order the book directly and more! With the holidays upon us, this is a great gift for a young nature lover! Disclosure: I received a copy for review purposes. I was not required to write a positive review nor did I receive compensation. For more information on this blog and on my posting practices, please refer to the disclosure policy at the bottom of the page. 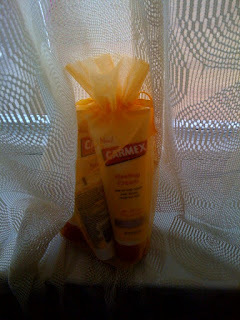 As part of the Carmex Blogger Squad, I get to try and share new products with our readers. The newest addition to the Carmex family is a fabulous line of Healing Lotions and Creams! For over 70 years people have come to love the healing power of Carmex® lip balms. 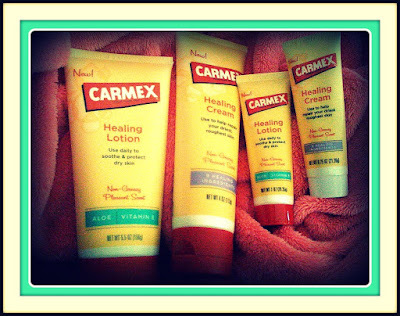 Finally, Carmex® Skin Care is here with a new solution to heal, soothe and moisturize your dry skin. CARMEX® HEALING LOTION Carmex® Healing Lotion is made using a patent pending process that delivers healing and moisturization without a greasy feel. CARMEX® HEALING CREAM Carmex® Healing Cream is made using a patent pending process that delivers concentrated healing and moisturizing for your driest, roughest skin. Both my husband and I love, love, love the scent. It is a fresh, sweet but not overpowering scent with a hint of the scent of Carmex. Even though it is sweet, it is appropriate for use by men or women. Both products smell the same - the main difference is the cream is a heavier concentration than the lotion. Both are absorbed into the skin quickly. I think that this is my favorite Carmex Product so far (in addition to the original lip balm). My hands get soooo dry in the winter so I will be keeping a small tube of the cream in my purse and a larger tube in the kitchen for the entire family to use. My husband is taking a travel sized tube of the lotion to work with him as well. I have one identical set to giveaway to one of my readers. Enter below! I am so glad a coworker mentioned how fabulous American Horror Story (AHS) was. I discovered Entertainment on Demand on my DVR, quickly caught up and am already addicted. A few online critics/commenters expressed concern that true horror fans will probably be turned off by the lack of gore. Although I love psychological thrillers - fantasy, suspense or paranormal - I am NOT a fan of horror or violence. As such, I actually found the gore to be very graphic and excessive so found it amusing that this was just simply not enough for some. It was more than enough for me! The first thing AHS reminded me of was Carnivale. I googled "American Horror Story" AND "Carnivale" and quickly discovered that many other fans share the same sentiment. American Horror Story (AHS) has the same creepy but intriguing quality of Carnivale. Of course this is what will keep me obsessively coming back for more....... Carnivale and LOST were, up until now at least, my favorite television shows. Hopefully we will get a full run of AHS for several seasons and not a lackluster ending (LOST) or, worse, no ending at all (Carnivale). AHS is definitely more obvious with what the underlying "mystery" - aka "I see dead people - compared to that of LOST, Carnivale, or other similar psychological, paranormal thrillers. The more interesting mysteries of AHS are actually slowly revealed through the back stories of previous residents/visitors and in the "uncertainty" of what will ultimately happen to the newest residents of the Murder House. I am fairly certain however that I can bury any notions of a fairy tale farewell at The End of THIS story. WARNING- Most of what is featured on Momanthology.com is family oriented. This is an ADULT show and has a MA (mature audiences) rating due to implicit sexuality, violence and numerous other reasons. It is not at all appropriate for children nor is it appropriate for any adults that are easily offended. Please watch at your own discretion. When I was younger I could read a book in a couple of hours to a few hours, but definitely had many days of starting and finishing a novel within a 24 hour period. Flash forward to the present - three kids, a full time job, a home, etc - I cannot remember the last time that has happened! Today I ended up working from home because Miss N. was sick and had to stay home from school. 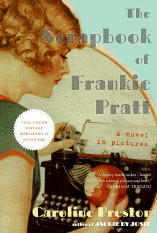 During the day I received "The Scrapbook of Frankie Pratt" in the mail. As a new scrapbooker and avid reader, I was looking forward to reading this novel. I opened the package, thumbed through the book and could not wait to take a closer look. After work I started to read the novel. I took a break to pick up the groceries, came home, put the groceries away, unloaded the dishwasher and resumed reading a couple of hours later until I finished. I tore through this book in a couple of hours. This novel is done in a scrapbook format. Follow the life of Frankie Pratt from adolescence (1920) through early adulthood (1928) while being treated to a beautiful collection of vintage photographs, artwork, poetry, quotes from literature, and memorabilia of mementos from the period. The story itself was lovely. Frankie is the only daughter from a family of five. Her father passed away and her mother has been struggling financially to raise Frankie and her two brothers. Through brief snippets of recollections, the reader follows Frankie as she ventures through many firsts - first dates, the first time away from home, first jobs, first loves, first failed friendships, first heartbreaks, first travels, etc. These are shared through the use of a typewriter and a scrapbook one inherited and one a gift. There was an obvious sweet and genuine flavor to the story but there were also an underlying humorous tone. Some of the story was predictable but definitely not to the extent that you could foresee the ending! It is quite challenging to believe that Caroline Preston wrote this book and not the larger-than-life Frankie Pratt. This is a beautiful book - more of a coffee table book than a novel. It is a must have for anyone with a love of the 20's, a love of scrapbooking, a love of art, a love of reading and a fondness for nostalgic vintage items. (READ - Holiday gift!). For more information visit the author's website, Harper Collins or your favorite book retailer. "a visually stunning, full-color novel told in the form of a scrapbook. Pulling from her own extraordinary collection of vintage ephemera and memorabilia, the author of the New York Times Notable Book Jackie by Josie, and two other acclaimed novels, Gatsby’s Girl and Lucy Crocker 2.0, creates the first ever scrapbook novel, transporting us back to the vibrant, burgeoning bohemian culture of the 1920s and introducing us to an unforgettable heroine, the spirited, ambitious, and lovely Frankie Pratt. In THE SCRAPBOOK OF FRANKIE PRATT we see an enticing array of flapper-era postcards, letters, magazine ads, ticket stubs, catalog pages, fabric swatches, candy wrappers, fashion spreads, menus, and other memorabilia featured on each and every page. Through these visuals, we meet and follow Frankie on her journey in search of success and love." ABOUT THE AUTHOR: Caroline Preston is the author of three previous novels, Jackie by Josie (a New York Times Notable Book), Lucy Crocker 2.0, and Gatsby’s Girl. She has collected antique scrapbooks since she was in high school, and has become an expert on the history of the scrapbook and the valentine in America. She has worked as an archivist at the Peabody/ Essex Museum and Harvard’s Houghton Library. She and her husband, the writer Christopher Tilghman, live in Charlottesville, Virginia. Disclosure: I received a copy of The Scrapbook of Frankie Pratt for review purposes. I was not compensated nor was I required to write a positive review. For more information on this blog and my posting practices,. please refer to the disclosure policy posted at the bottom of this page. I remember when I was in my 2nd year of college I went out with a long term ex-boyfriend, his best friend and his girlfriend. (Ironically my ex ended up marrying that girl but that is a different story). We decided to go out for a fancy lobster dinner and even though we were underage, for some reason we were able to order wine and beer with dinner. Afterward we went to a movie and I was fine until about half way in when I started experiencing the worst stomach ache of my life - I cannot even describe the pain other than it was sudden, it was intense and I felt like I wanted to die. After the movie I convinced the others to drive me home while I listened to my ex say how I always "ruin everything". (Yes, I am glad I was not the one to marry him!). Of course at the time that made me feel even worse but I also felt so bad I just wanted to get home and head to bed. Once I was dropped off, that is exactly what I did. I started to piece together that I had both reactions after a seafood dinner but was puzzled because there were other times I had seafood and did NOT have the same reaction. I finally figured out that the difference was when I had the reaction when I ate certain shellfish and had a drink. I could eat shellfish alone (I think) or drink alcohol with other foods and be fine. Only when I paired the two did I have the reaction. What I had was a seafood allergy. But only with beer, wine or liquor. I found this thread that has accounts for others who experience the same adverse reaction when mixing seafood and alcohol. I was glad to find others that have the same reaction. When I tell people about my allergy they usually give me a strange look so it was a relief to find others with the same allergy. Most reactions were even more severe than mine. I can eat Shrimp with no problems, even paired with alcohol. My reaction to the lobster and crab was so severe however I am afraid to test it out. I am not sure why I can have shrimp but not lobster or crabs. Now I have inadvertently had a bite of crab dip or a sip of Lobster Bisque with no reaction but that is a very, very small amount. To think about actually sitting and eating lobster tail or a plate full of crab legs puts the fear of god into me. Ironically my husband found out he was allergic to oysters. I made oyster stew one time and he got sick (no alcohol involved).... He said he must have had a "bad oyster" as he became ill, but no one else did. The "bad oyster" theory was not sitting well with me because it was a stew that all the ingredients had simmered together for a while - basically we ALL ate the same meal. A couple of years later we were in Seattle and went out for seafood. He had a plate of Oysters. We get home and he was in bed or in the bathroom for 4 days. He will never eat oysters again. For October Freschetta wants everyone to know that they are proud to support Pink! When you purchase specially-marked FRESCHETTA® products, you’re helping reach the goal of donating $50,000 to the Memorial Sloan-Kettering Cancer Center. Enter your code at http://www.proudtosupportpink.com/ and we will be $1 closer to finding a cure. Each week, Freschetta will be giving away an iPod shuffle®* to 50 lucky winners. You can earn extra entries in the sweepstakes by sharing PROUD TO SUPPORT PINK® with your friends and family. Click HERE to find out more. In addition you can read survivor stories or share your own. If you have not yet tried Freschetta you are missing out. Freschetta offers many unique, gourmet flavors. If you have not tried yet, now is an opportune time. You will be getting a great pizza and helping a great cause. I received a prize pack from Freschetta and was able to share with my readers. I did not receive any compensation for this post. That is the slogan I remember from the 80's. Well Keri is very much still around with a new mantra of "All day soft, All day smooth" . Keri is relaunching their high quality lotions that have been around for generations. In celebration of their 50th anniversary Keri has updated their packaging for a more fresh and modern look but brings the same lotions that have been loved for years. On Keri's website you can view and select products that are best for you. Keri® Original Daily Dry Skin Therapy – Enhanced with five essential moisturizers, this product is for daily dry skin therapy for smooth, healthy looking skin. Keri® Advanced Fast Absorbing Lotion – This non-greasy, lightweight formula is fast absorbing for silky, soft skin. Keri® Basic Essentials Hypoallergenic Fragrance Free Lotion – Made with Aloe Vera and Vitamin E for a lightweight formula that provides optimal hydration. Keri® Luxurious Deliciously Scented Nourishing Lotion – A total indulgence for the skin, with a light apple scent and Vitamins A, C and E.
I have tried Keri in the past and was looking forward to getting re-introduced. I actually opted to review the Shea Butter formula. In our home we suffer from dry skin in the cooler months. My daughter is already starting to display some of the signs. I also suffer from dry skin on my hands when cleaning and washing dishes. Yesterday we cleaned the house and my hands were irritated towards the end of the day. I used the Keri and it quickly moisturized and soothed my skin. I noticed that it absorbed immediately and left just the hint if a nice, light and fresh scent - not overpowering at all and appropriate for men or women. I have the bottle conveniently sitting in the entrance to the kitchen so we can all use it. Please refer to the FAQs posted on their site about best uses and suggested practices. You can purchase Keri at national retailers - see HERE for a listing of stores. One lucky reader will have a chance to win as well. Please see the Rafflecopter form for details, rules and to enter. EASY ENTRY.